Rembrandt is a 17th century Dutch artist. He painted over 90 of his portraits. And his most famous self-portrait was written in 1640, already being a well-known and recognized artist. Rembrandt became famous as a portrait painter. Among other famous self-portraits, the work of 1640 stands out. Pictured here is a confident man dressed in 16th century fashion. Here he emphasized his spiritual kinship with the great predecessors of the High Renaissance. Rembrandt in the picture is 34 years old, and he demonstrates in it his social significance and position. His clothes are rich, trimmed with expensive fur. A massive chain around the neck. The artist’s view is melancholic and confident. The background of the picture does not attract attention, it is neutral. Therefore, only the figure of the artist attracts the viewer’s attention. 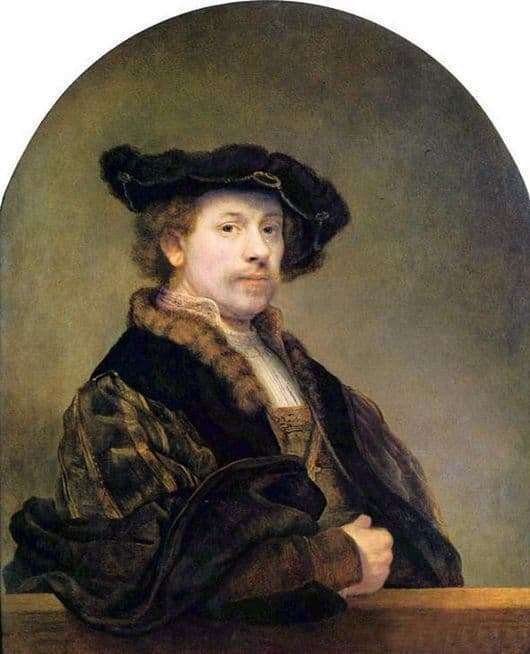 Rembrandt painted himself in a variety of clothes. It could be the clothes of an Amsterdam merchant with fur trim, pendants and a heavy chain, or it could be modest clothing, with a simple beret on her head. The self-portrait for Rembrandt is an expression of himself and his inner world. The slightest change in his own soul, he expressed a self-portrait. Rembrandt wanted to express all the wealth of human emotions and expressions, posture of the body and the position of the hands with paints, depicting a portrait. In his work, he worked through every detail, tried to display the nuances of a human face, to depict on the canvas the inner world of every person, including himself. On the self-portrait of 1640 there is a signature and a date, below is the inscription self-portrait (in Old Dutch). Rembrandt was a special artist of his century, but was not understood by his contemporaries. In the 19th century, Rembrandt is remembered. Self-portrait of Rembrandt in 1640 exhibited at the National Gallery in London.